Introduction price of $2.99 - Limited TimeLearn to build your first Spring Boot application with an actionable and hands-on approach.It is NOT a compendium telling you everything about Spring Boot and still leaving you back with no clue.We build a real application together, and I will explain you the steps and libraries involved on the go. You learn best by coding. The way I love learning too.What you will build:We build a Microservice for storing comments and providing a REST Interface for interacting with the data. 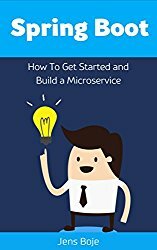 The sample application is modeled after a real production application to guide you through building your first Spring Boot application.What you will learn:How to build a microservice with Spring Boot 1.4.3How to work with a relational database using the Spring Data JPA FrameworkHow to write the REST API using Spring MVCHow to create a service layer and integrate a legacy library using its own Spring ApplicationContext in an XML fileHow to test the applicationA simple way to secure you applicationHow to use monitoring and health check out of the box with Spring BootHow to deploy your applicationThis book is for you whenyou have a bit of experience with Java and want to learn Spring Bootyou already work with the Spring Framework, but you are new to Spring Bootyou love building applications and learning new technologiesIt is NOT for you ifyou like reading fluffy compendiumsyou don't know the Java language at allAnd if you have questions, do not hesitate and contact me using the email address at the end of the book. I'll answer your questions and improve the book with your feedback.